Commentary: It's kind of amazing that the biggest legacy of The Phantom Menace is the character with the least dialogue. 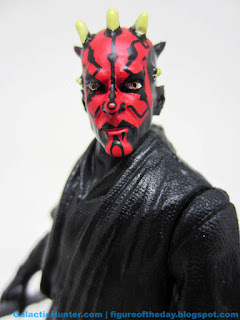 Darth Maul is pretty much the only aspect of that movie to survive mostly unscathed, which is impressive given his bisection at the film's climax. He looked cool, and dammit he needed to - the Jedi heroes were largely bores, everybody seemed to wear gowns, long coats, and robes, and the movie's centerpiece was a race that gives new meaning to "show-stopping." Fans latched on to Maul, and naturally he had to go - but he's been resurrected a few times, becoming the prequel era's Boba Fett. 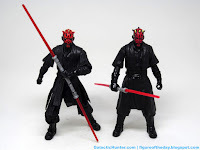 Maul even came back in The Clone Wars giving him an arc that brought him in to Rebels - but most of the toys still center around The Phantom Menace, including this "value" 6-inch action figure. It's basically the same size and proportions as The Black Series release with less articulation, no soft goods, and a preposterously cheaper price point. Seriously, $6. $6! 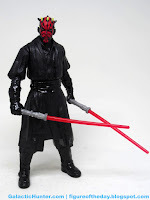 It'll be a great stand-in for your 6-inch figure shelf if you missed the 2013 super-articulated Maul - or if you want to display that figure with his full robes and hooded head, and want an alternate costume version hanging around. As far as I can tell this sculpt isn't the same as the other ones, which is nifty given how many figures seem to be derived from the same digital sculpts these days. 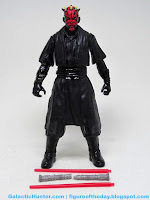 The figure has a decent Ray Park head and amazing robe textures, plus slick black boots. Courtesy of his oh-so-black duds, glossy black paint has been added to his boots, gloves, and belt to add some level of contrast in a sea of darkness. 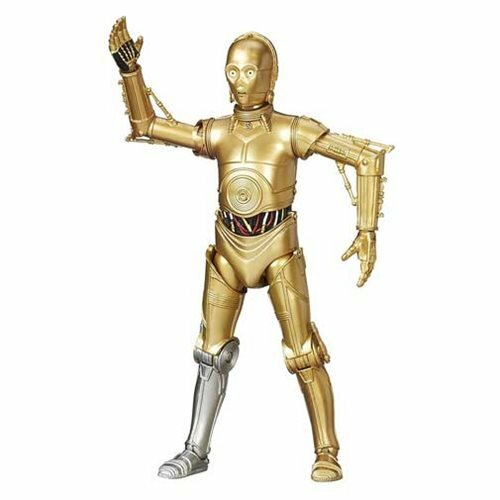 The arms, neck, and waist rotate freely and both hands have no problems gripping his lightsaber - combined, or halved. I love how he stands with no problems, making him an ideal desk figure. 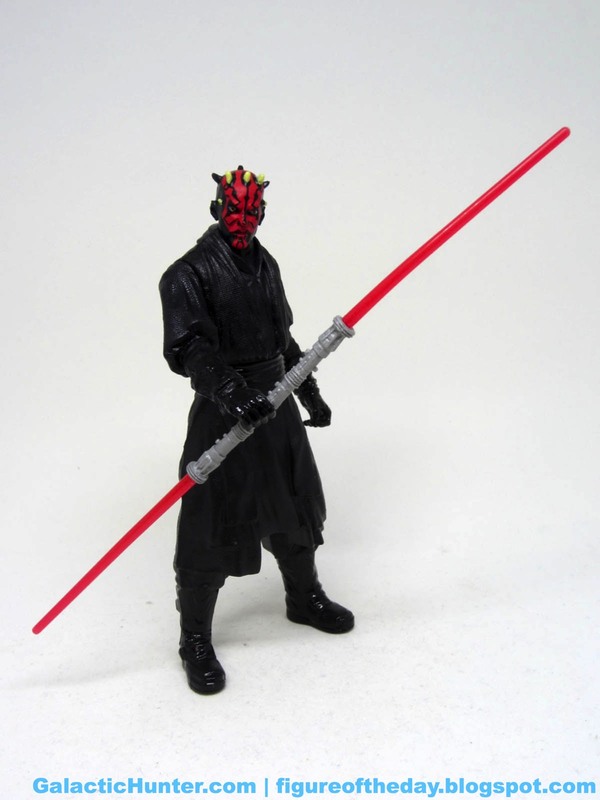 Maul has the fanciest weapon of the format - the lightsaber is completely unpainted but splits in two with removable blades. 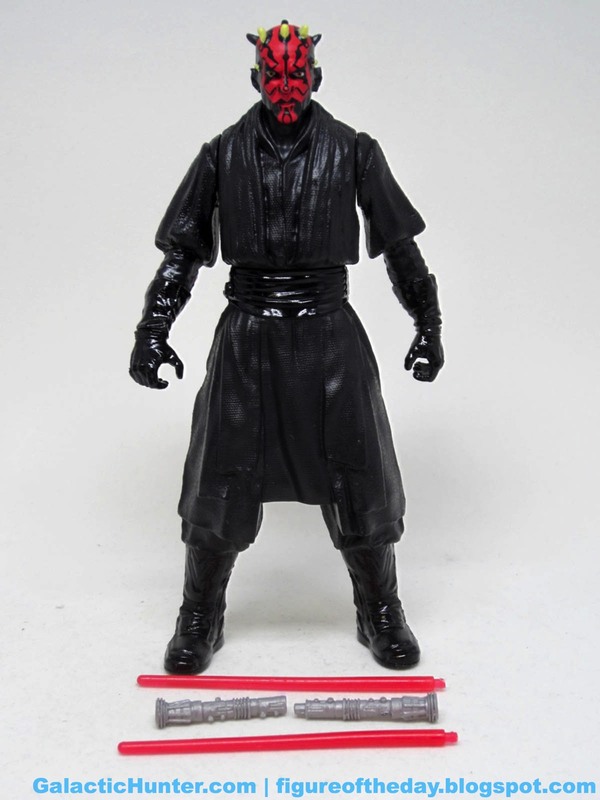 This is fancy - fancier than many of the 1999 Maul figures, at a fraction of the price. The only place he comes up short is deco. The heads of every sample I see have a little red "ding" on his nose which looks weird, and I'll probably touch up with a black marker after this review. The horns are only partially painted - the front ones are, but the ones on the back of his head were left unpainted to keep costs down. The lightsaber's hilt is also completely grey, which was unusual for Hasbro. Maul figures usually have red or black buttons and switches on the hilt to add some color to the otherwise bland silver pole. This one isn't silver, but grey. You might want to paint it. I got my money's worth - it's a nice figure for the price, offering a worthwhile size and just enough detail to not be terrible. The plastic quality feels like a plussed up McDonalds toy, but I'm fine not having to necessarily eat the food. (More time to go to Lenny's.) Based on the Disney-era figures, I assume we'll likely never see a figure from The Phantom Menace for Maul to fight. If we do, it'd probably be Qui-Gon Jinn but I sincerely doubt it'd be soon or ever. If you stumble on this one at $6 or $7, get it - I've seen so few since its release last year that I don't know if we'll see a ton more. Maybe you're luckier than I am, but I rarely see these up for sale on eBay or Amazon either. It's one of those weird little Hasbro figure items that you don't know and don't care that you don't have. 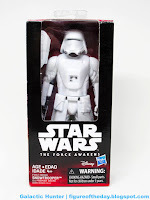 Collector's Notes: I got mine at a Big Lots last year - she shipped with Rey. I've seen these figures maybe one or two more times since - they don't seem to be particularly easy to find, but the assortments of this kind of figure hit Dollar General, Family Dollar, and Big Lots in my neck of the woods. 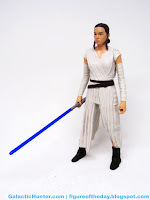 Commentary: This is a 6-inch Rey figure with limited articulation - I'd say it feels like a really good, really big Burger King toy. She has jointed shoulders, a jointed neck, and a jointed waist. 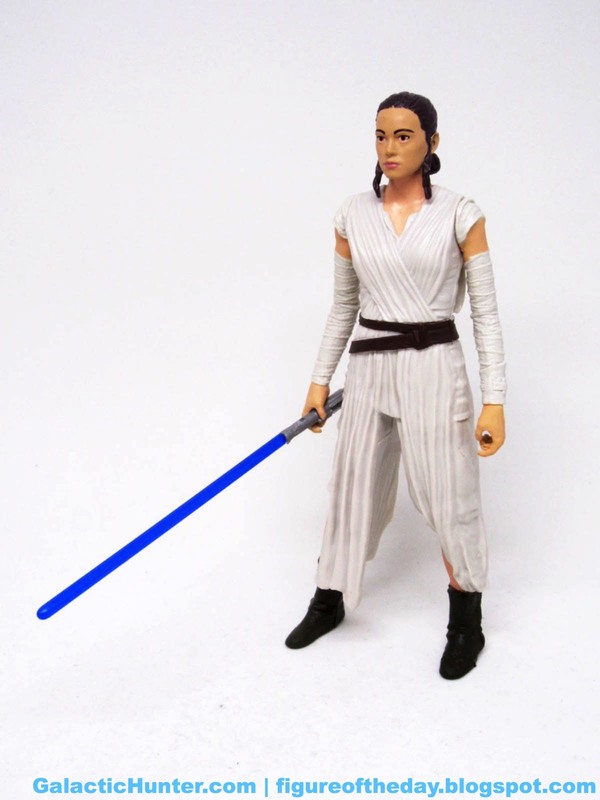 Rey seems to be derived of the same basic digital sculpt that formed the basis of numerous other products, which is good and bad. One one hand, she has a decent likeness and a better-than-expected paint job on her head. On the other, she feels a little hollow. The figure is light on decoration - and mass - as you'll see with a tan dress sporting minimal contrast. A brown belt and shoes do a good job breaking up the sea of single color, and her skin has been painted surprisingly evenly on her hands, neck, face, lower legs, and upper arms. With more paint, this would be an amazing figure - as is, it's still decent. 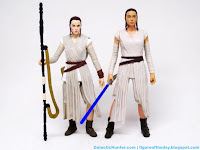 Rey has no problems standing or holding the lightsaber, but can't actually do much of anything. 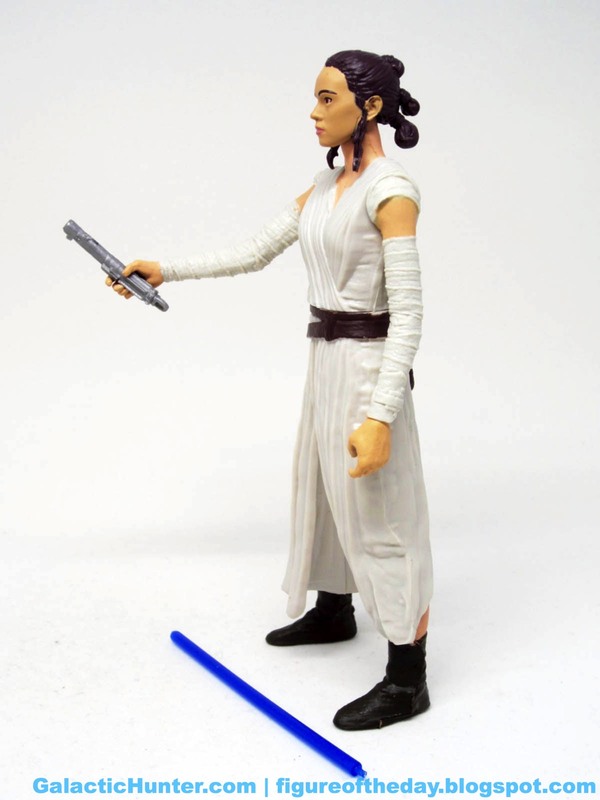 This makes her a decent collectible sized to fit in with your The Black Series toys - at least in terms of scale. When it comes to deco and articulation, this is more or less a great toy for kids. 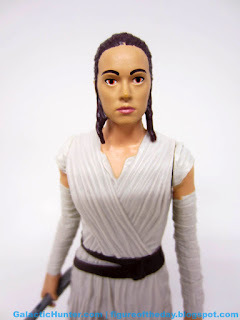 It's a shame she wasn't easier to find - heck, I'm not even sure if she's rare or not since the assortment is so scarce - but it's a big, cheap Rey that you wish you had a year ago. What really surprised me was the lightsaber - not only is it removable from her hand, but the blade pops out of the hilt. 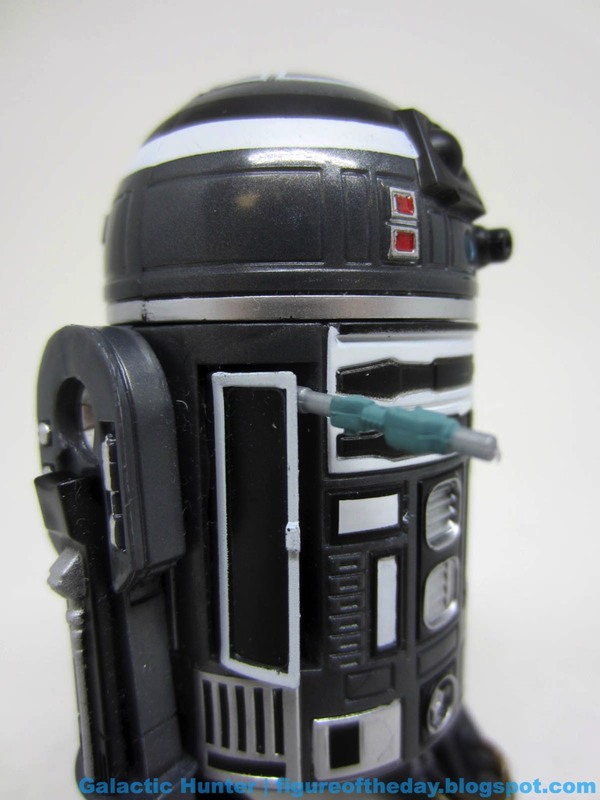 It's also the darkest blue lightsaber I think I've seen on a Hasbro action figure. It's not opaque, but it is fairly dark. The hilt is a slightly different take on the classic "Skywalker hilt," as the top isn't tapered - it's flat. The blade plugs right in, and the grip is completely undecorated. This is by no means the most impressive or most fantastic figure in this style, but it is the only girl so far. 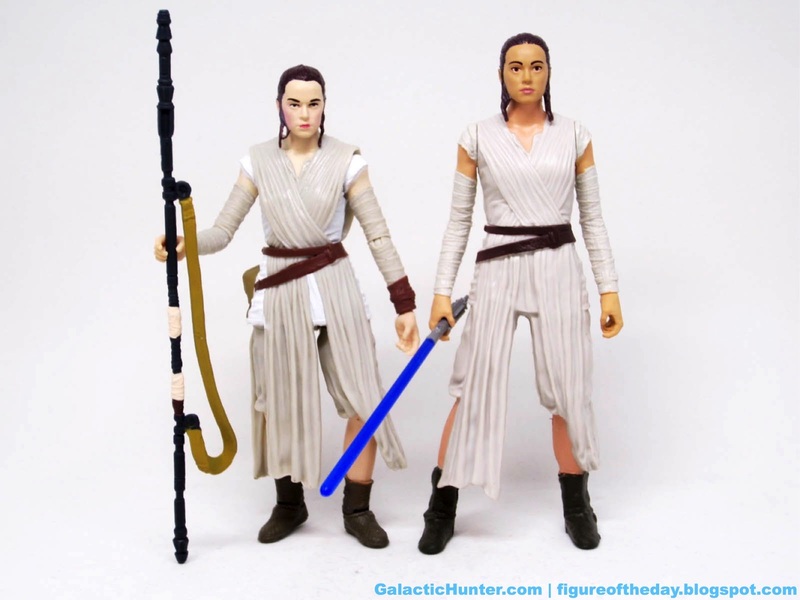 Hasbro didn't take any shortcuts in terms of delivering a figure that looks like Rey with an appropriate amount of personality, and thankfully there's a fancier version for fans wanting The Black Series levels of accessories and decoration. And BB-8. 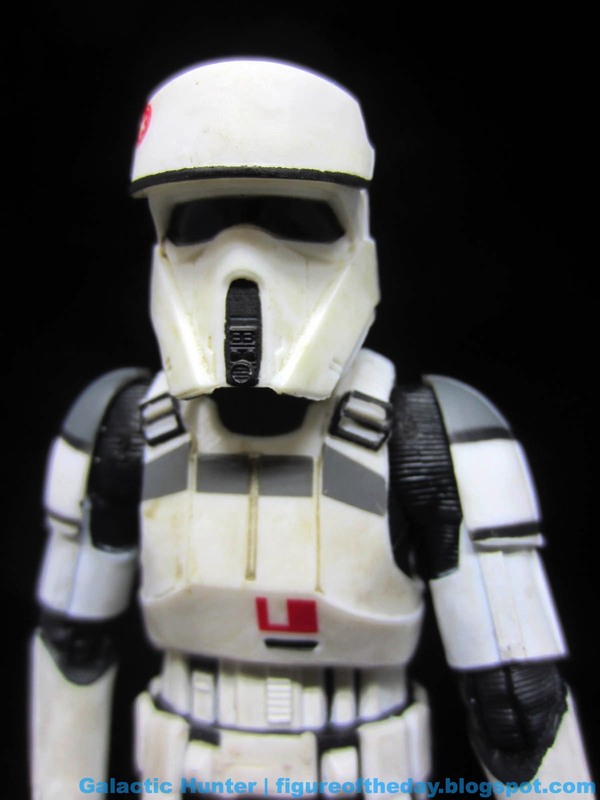 I like this one enough to hope Hasbro cranks out some more, and I've been haunting those lower-level discount chains hoping to see Jyn Erso, a classic Stormtrooper, or any character that might translate nicely to the "cheap kid toy" format. If you see Rey for six bucks, she's worth your while to snag mostly because I doubt most people are going to see her anywhere, ever. Collector's Notes: I got mine at a Big Lots last year - she shipped with Darth Maul. I've seen these figures maybe one or two more times since - they don't seem to be particularly easy to find, but the assortments of this kind of figure hit Dollar General, Family Dollar, and Big Lots in my neck of the woods. Commentary: If you like Shoretroopers, how about buying one that has less color? 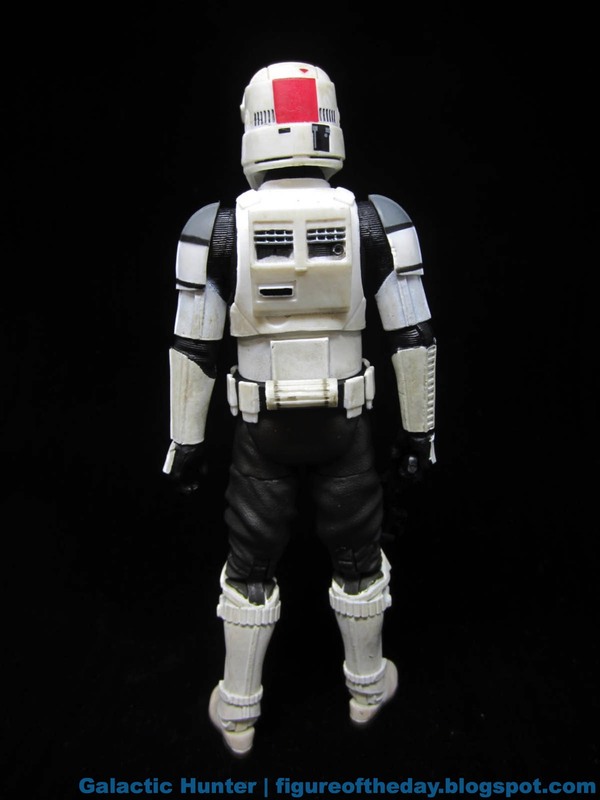 The Imperial AT-ACT Driver is basically the same as a basic Scarif Stormtrooper with new deco - which means it's also basically the sam as the Hovertank Pilot with a new helmet and new colors. The 6-inch figure has pretty much the same articulation - just under 30 joints keep this figure able to pose any which way you might like. 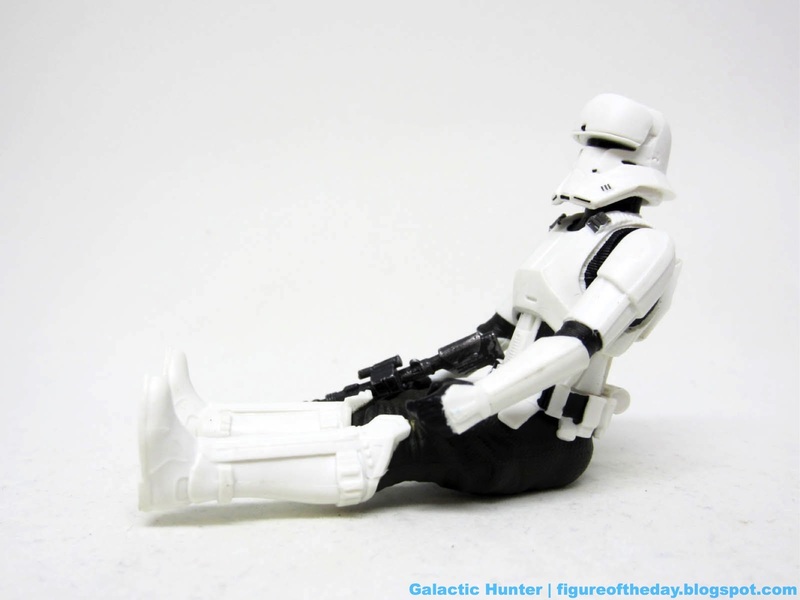 He can even sit - there will never be an AT-ACT for him, but that's life. The figure feels sturdy, has no problems standing, and looks great. Hasbro has wisely reused a good mold - bits of the Scarif Stormtrooper have been used for at least four different figure releases so far. That's using all the parts of the buffalo. Deco is good, but I'm not sure if it's right or not. One of the challenges of mass-producing toys with different kinds of plastic is getting the color right. Indie toymakers like Onell Design excel at this. Hasbro's still growing. The shin armor on the AT-ACT Driver are painted white, while the arms, feet, torso, and head are molded in white plastic. You can tell the difference - they look like different materials. The colors do match quite nicely, but it's clearly a different material. The biceps don't quite match the forearms, or at least that's what my eyes seem to see. My favorite detail is the little reddish/orangey Imperial cog on the visor part of the helmet. It's less obvious that's what this is on the 3 3/4-inch figures, so seeing it blown up here is a treat. I love the stripes, I love the painted shoulder buckles, and the dirt ain't bad either. It's a pretty good figure for the price, and a good idea for an exclusive figure. It's not a significant player in the movie, so some fans could miss it and not care. 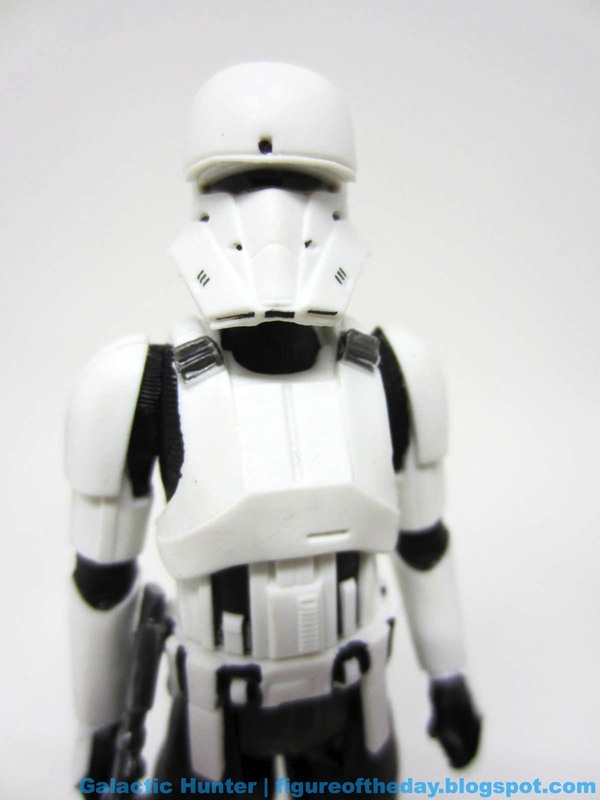 It's a trooper, so some fans would want a dozen of it. It's similar to other Troopers that people like, so the chance to get more of the same - but different - could be quite engaging. I was unable to find these pre-launch but jumped out at lunch on launch day to snag it and the Blu-Ray/DVD combo set. Clearly the store that offers the exclusive figure on launch day has found a way to get me to buy a new copy of the movie rather than wait a few months for Zia Records to start selling used ones for half price. Kudos, Target and Hasbro. Collector's Notes: I got mine from Target. A few sold prior to launch day, and a bunch were out on launch day despite being seemingly sold out beforehand. Commentary: A new Darth Vader? Sold! 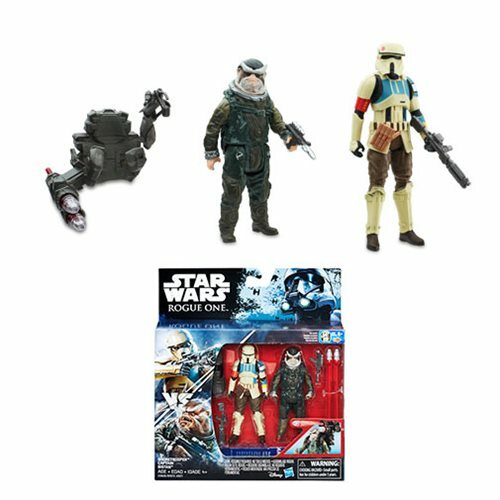 This Rogue One and/or original Star Wars version was made to be part of an "original 12" update in the 6-inch line. It's kind of amazing, because this isn't a grouping that Hasbro's previous caretakers have really exploited. 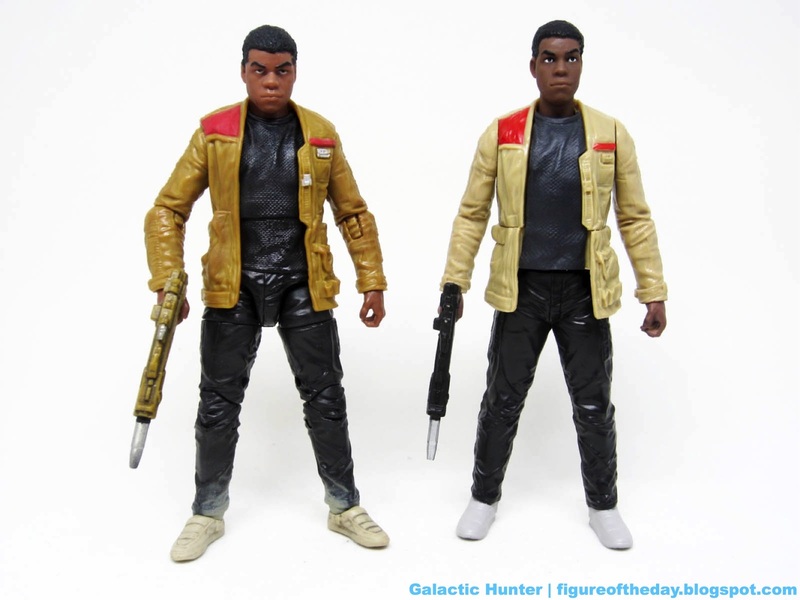 Heck, we're 22 years in to the 3 3/4-inch line relaunch and they're still not done updating the 1978-1985 line - so it's neat to see them pounce on a group of figures and update accordingly. 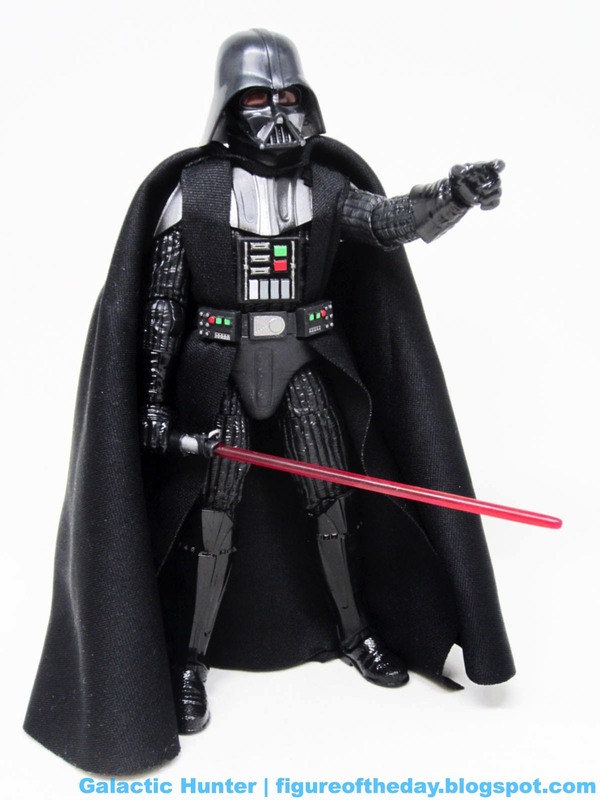 The costume tries to replicate the original Darth Vader suit, complete with red lenses on the helmet and the unique armor with shoulders covered in cloth robes. He's even got the different gloves, with the ribbing going across the hand rather than parallel to the fingers. I like it - and it has some decent features, too. The articulation of a figure in The Black Series seems to be pretty much always the same - about 26 points of articulation is now normal, making Hasbro's Star Wars line better than most of what Mattel releases but not always as good as Hasbro's own Marvel Legends offerings. 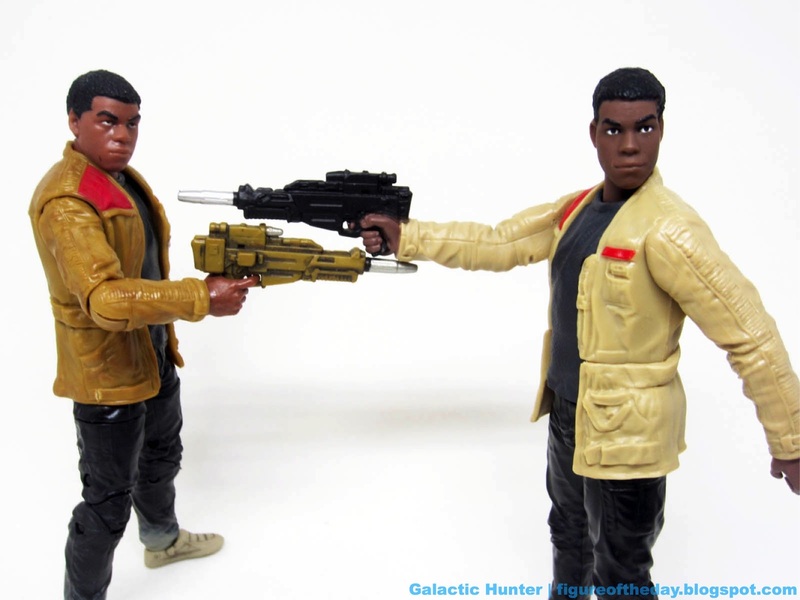 Marvel's figures are more likely to have double-jointed elbows, while Hasbro has seemingly given them up for Lent and decided to stick with it for the long haul. I love the color of the silver bits on his armor, the bright green and red lights, and that the gloves and boots are glossy while the "fabric" parts are a bit more dull. 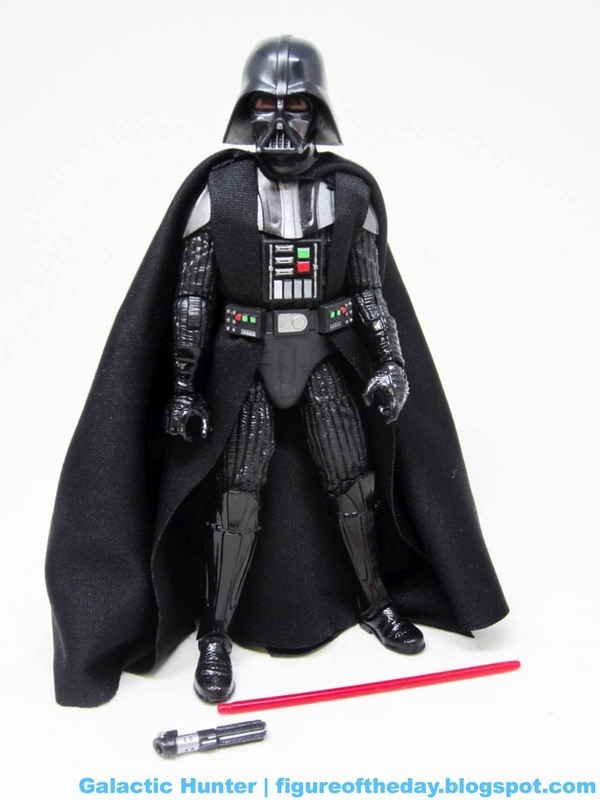 The quilted pattern looks wonderful, and he has no problems standing or holding his lightsaber. This is crucial. 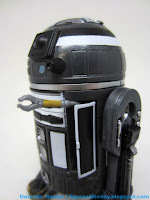 What really surprised me was the lightsaber - the blade is not only removable, but the hilt has a hook on it. And the hook actually attaches to the belt - this is a detail often forgotten, so I really appreciate it. 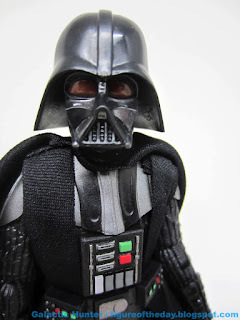 Short of adding some bonus swappable hands to have a "let's choke Captain Antilles" pose there's not much else you could hope to get from a Hasbro Darth Vader, so I'd say they did a perfectly nice job consistent with their other toys. The cape hangs a little strangely, but the fabric is nice enough and the figure is a gem when carded. The diorama itself is nice, with the ability to connect multiple ones together. The foot pegs are all the same size, which is almost good - if you'll recall, Hasbro didn't have a consistent foot peg size until after the third wave and they still haven't quite nailed it. As such, some figures don't take to the pegs too well. And yes, this includes the Stormtrooper. And C-3PO, whose foot holes are too shallow. 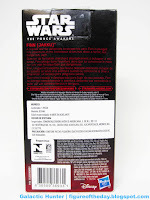 It's pretty though - just be very very careful when applying the Star Wars label. I screwed mine up. I'll probably buy another one at some point and try again, because I'm a dunce. I'd say it's good enough for $40. For less than that, you positively need to buy more than one - the figure's worth $20-$25, the diorama's no slouch for $15 or so. It also has a reversible backdrop, so really you may as well get at least two of them. I love the overall concept, but I doubt anybody would've minded Vader being sold individually - hopefully Hasbro boxes him later so even more people can have access to this figure. For the price, I really like what Hasbro delivered. 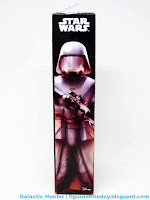 Collector's Notes: This is a weird one - a carded Darth Vader figure to finish your set of the original 12 is sold in the Legacy Pack, which has a diorama in it. 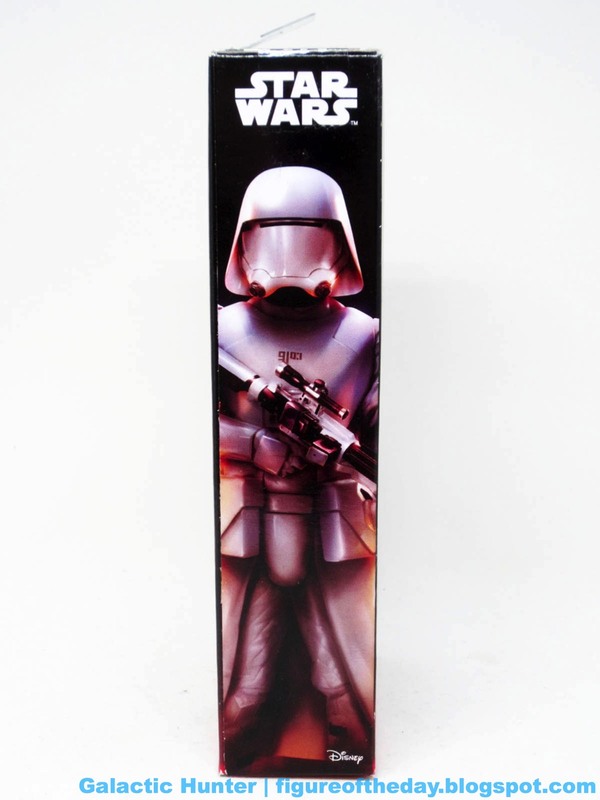 So you have to buy this boxed thing, open it, and remove a carded figure from inside it. I'd advise buying at least two of this set, especially since you might want more dioramas. I got mine from Entertainment Earth. 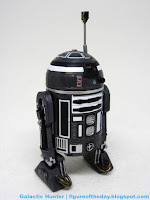 Anyway, R2-F2. It's dark grey with lots of white highlights and black detailing. The little lights on the right side of the dome are now red, with a blue dot in the middle. The black eye remains, and the general layout matches previous action figures. Since there are precious few reference photos available to the public, I don't know if it's accurate. 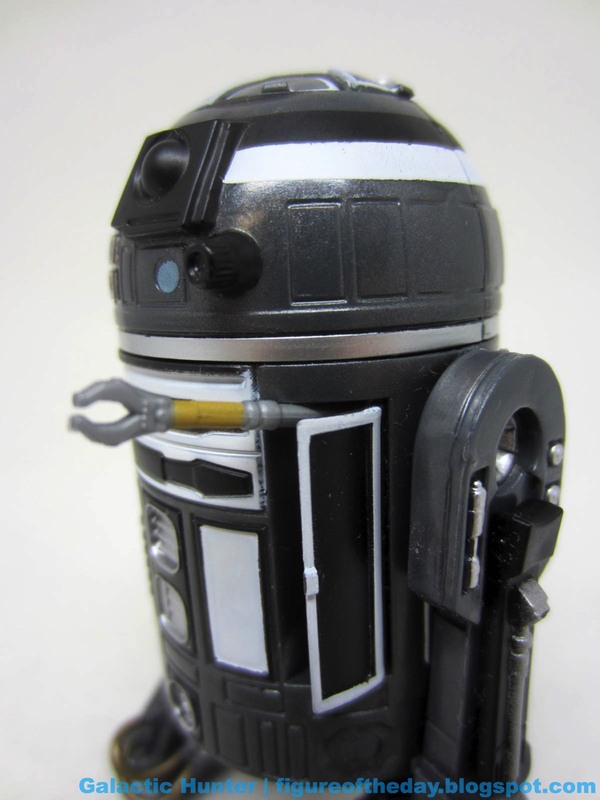 It sure looks neat, but it might be incorrect as R2-Q2 (who has the same basic decoration) is generally made as a much lighter grey color. 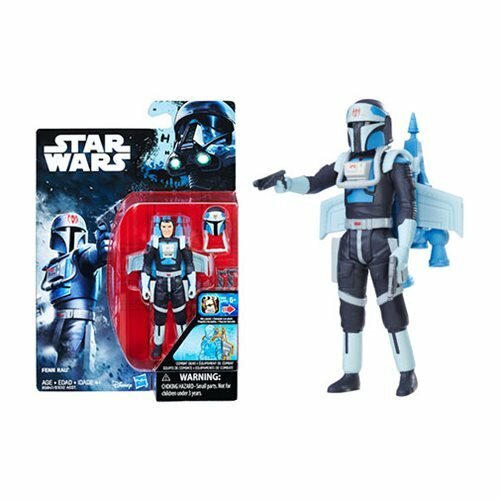 It's sharp, but as of now there are no companion Biggs Darklighter figures to go with it. Or X-Wings, for that matter. 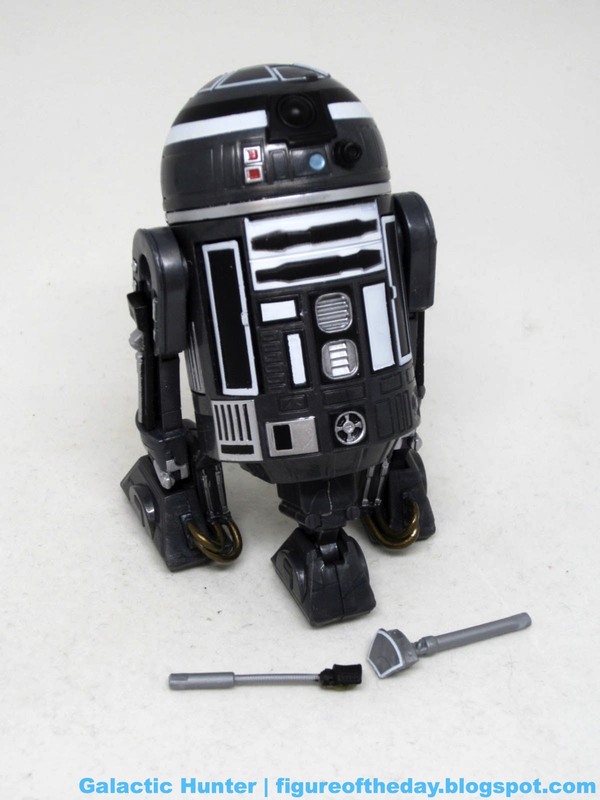 All of the trimmings of R2-D2's body are here like the retractable third leg and the pop-open arm panels. 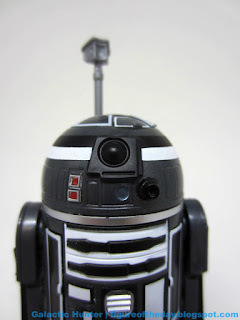 The dome has two removable panels with swappable scopes, and it's a generally good looking droid. It might be a smidgen underscaled for the 6-inch action figure line, but there's no denying that in and of itself it's a decent looking piece. In my neck of the woods this set is long gone, but the asking price was surprisingly good given what you get - 3 droids for $56? That was a bargain. If you see it for around that price, do yourself a solid and buy it. In five years of 6-inch scale figures, we've had a grand total of four astromech droids. It's still more than 3 3/4-inch figures had in the first 20 years (not counting R2-D2 variants) though. Commentary: The answer to your question is eBay. I had to order this Finn (and his wavemates) from Mexico for about $10 per shipped last year, because they never actually showed up in the USA so far as I could tell. These value channel items are popular in markets in need of cheaper products, so Hasbro doesn't play them up as much here. There have been three waves, two of which hit the USA so far. 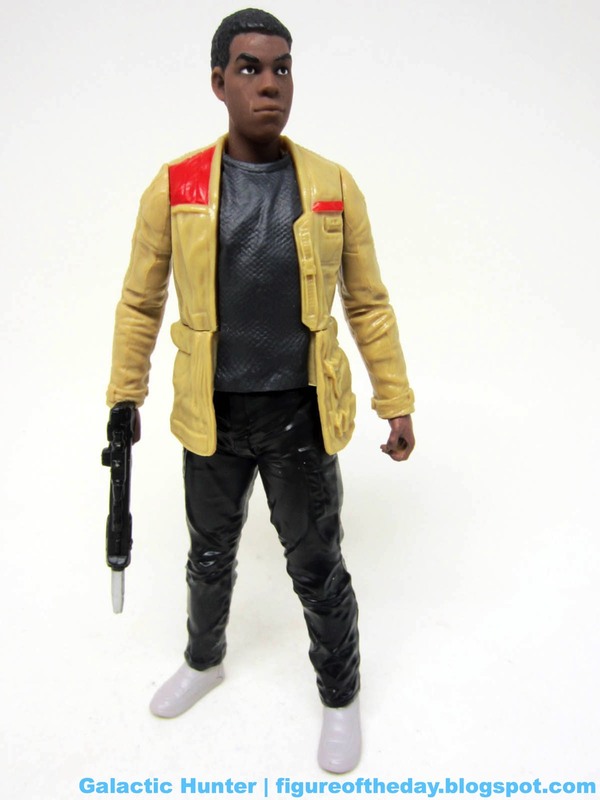 It would not surprise me to see Finn or others get released for The Last Jedi later in the year, but as of this moment I have no idea if this 6-inch 4-jointed figure will ever be sold to American kids. For what it would sell for here - about $7 - it's killer. 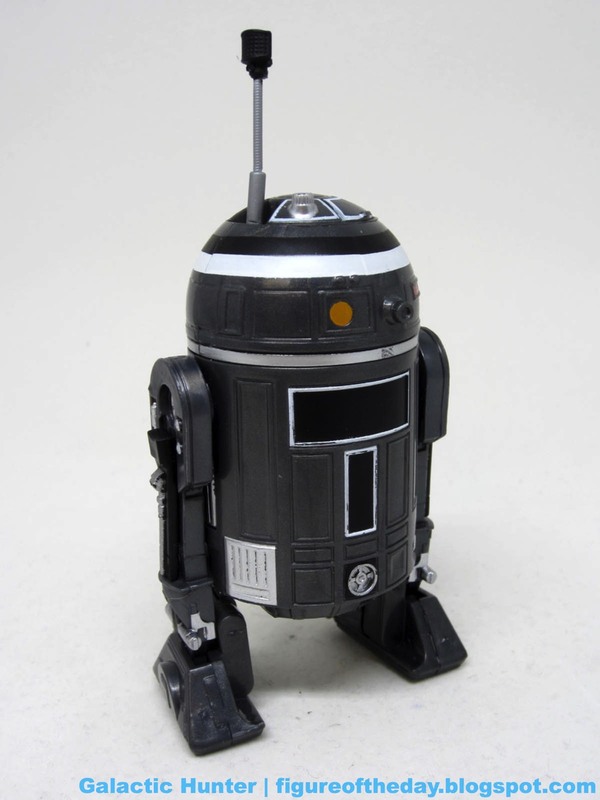 Hasbro's normal 3 3/4-inch figures are about $8, and this one is 6-inches tall but lacks any accessories. 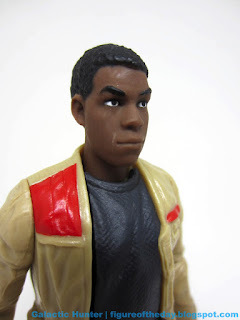 Finn has jointed shoulders, an articulated waist, and a swiveling neck - that's it. 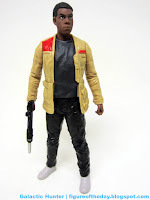 He's basically the exact same size as his The Black Series counterpart with a lighter jacket and a shirt that's a lighter grey. And he's got no dirt on his shoes. 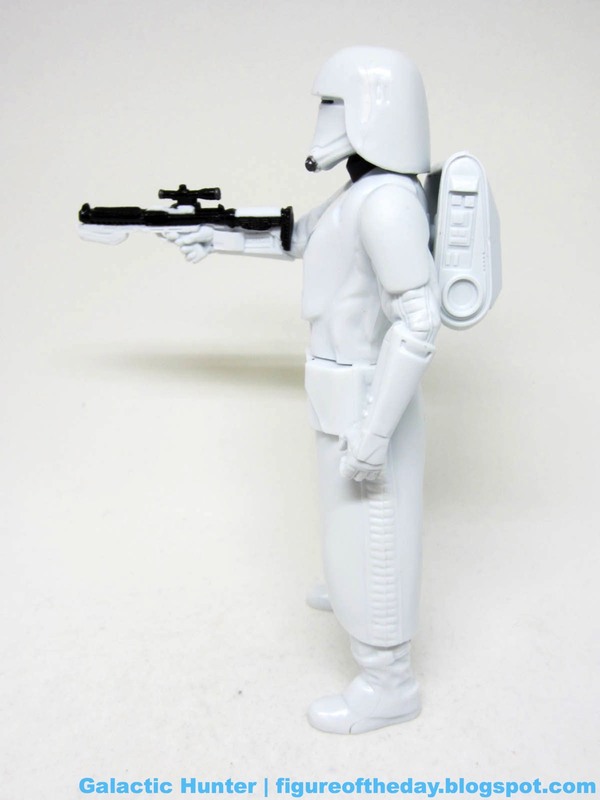 And his blaster is a totally different color for some reason. Also it isn't removable from his fist. 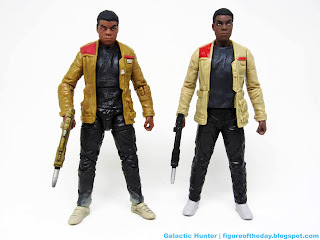 This cheaper 6-inch Finn has darker skin and seems to be derived from the same digital files as the other figures. A lot of the folds and textures are in the exact same places as on the other figures, just without the cuts for articulation or certain paint applications. He can't sit, but he can stand as long as his arms are straight. Once you tilt those shoulders up, he may fall forward. This is an oddity for collectors. It would be a kid line, but kids aren't going to get it in the USA just yet. It's basically a statue, although its ability to stand up without too much of a fight is arguably a fantastic feature. Hasbro left off the silver paint on the jacket and the color may not be exactly what you want, but given the work you're probably going to have to put in to track this down? It's all moot. I doubt you'll want to bother to get it unless you're a completist in the format (or it hits US shelves), but for $7 or less it's fantastic. For $10, you could've had the 12-inch one too, though - so maybe you really don't need this one. Collector's Notes: I got mine from Mexico via eBay. Wave 1 was international only so far (Australia, Mexico). It's hard to find these because not many come up for sale and there's no consistent branding/name for this particular scale. Good luck! Commentary: Tanks for the pilot! Actually, no tanks - just pilot. Rogue One gave us a short line with great designs that hopefully Hasbro will revisit and/or Disney will revisit with future movies. 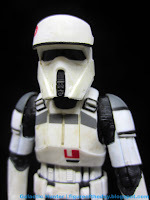 Imperial Hovertank Pilot figures provoke collectors to ask "So where't the tank?" It's kind of funny - it used to be the other way. We'd get an X-Wing, TIE Fighter, AT-ST, and so on and it'd be years until the pilot figure came out. If we were lucky, just one year - figures and pilots hitting at the same time were something of a rarity unless it was a pack-in or a prequel trilogy thing. 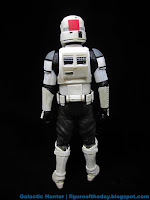 The Hovertank pilot is interesting in that it shows how much mileage Disney (and Hasbro) got out of the design - you can tell the body, arms, and legs are largely shared with the Scarif Shoretroopers and AT-ACT drivers. The belts are tweaked, the helmets are changed, the deco is different... but the body is largely the same. All of the joints move freely - unlike certain other pilot figures I could name - and it seems to share parts with the single Shoretrooper. I might be wrong. I love how the design doesn't have a belt to hinder hip movement, because I really do need all the parts to swivel freely to be happy in life. Otherwise, the cutting begins. The figure's helmet is probably my least favorite from Rogue One because it has a lot in common with the helmets I didn't like from The Force Awakens. There's no real "face," just a white slope with a slit for the eyes. I like a hint of a mouth or a nose, but that's not on Hasbro. 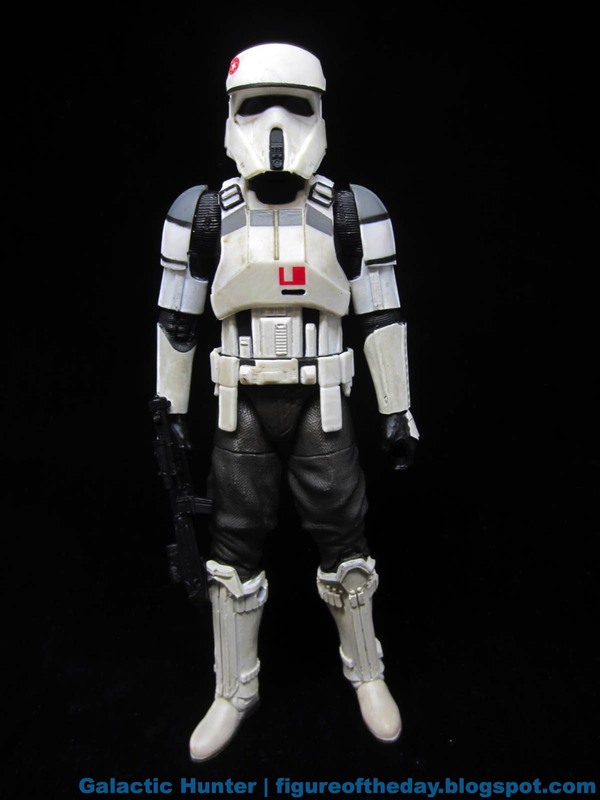 The figure seems to be a pretty close match to the movie with a black bodysuit, white armor, and a silver buckle on each shoulder. I was surprised to see Hasbro even painted the vents on the back - nicely done! This is a weird set, and this is a strange choice of figure for that set. I'd love to see more, and a vehicle, so people could troop build at a sensible price. The other figures in the box are good, and I absolutely love the painting on the package. 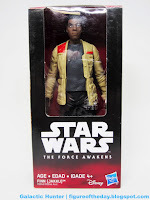 It's a great set for kids or collectors in terms of character selection, because you get good guys, bad guys, troopers, heroes, villains, and whatever it was Forest Whitaker is doing. 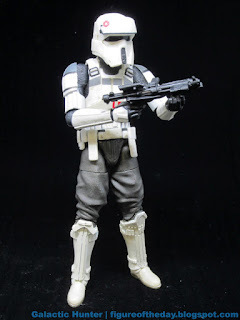 I'd have been fine if Hasbro tossed in a normal Stormtrooper or Shoretrooper in the set instead, but hey - I'll take something new. 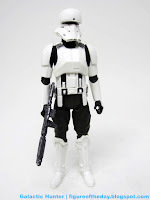 It's a nice design that can stand or sit easily, and he can hold his blaster. If you're sitting there griping about elbow joints, you know and I know that's not the kind of figure Hasbro set out to make. Taken for what it is, Hasbro ticked all the boxes and delivered one of its better pilot figures in the last few years. If you think you might want this set just for this figure, I'd say it's worth tracking down. 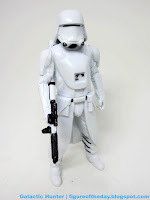 Commentary: While I'm extraordinarily fond of this figure format, the 6-inch First Order Snowtrooper seems to feel more like what you might expect when you hear "cheap 6-inch figure for export markets." 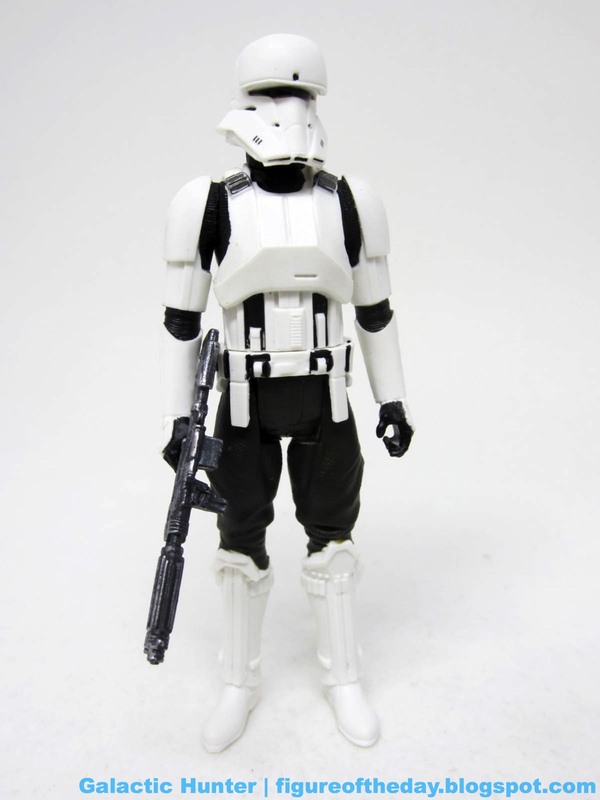 It has a good center of gravity - this means he can point the blaster while remaining standing - but it's hollow with softer detailing and not all the paint applications you might want on your faceless troopers. 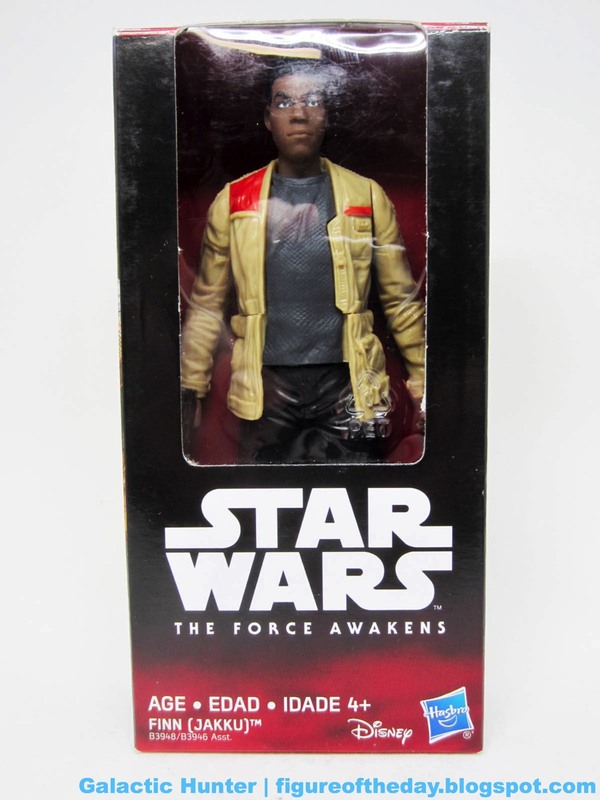 Interestingly, it did see release before the 6-inch The Black Series action figure, but not by much. This is a neat discount collectible, but not much of a display piece. 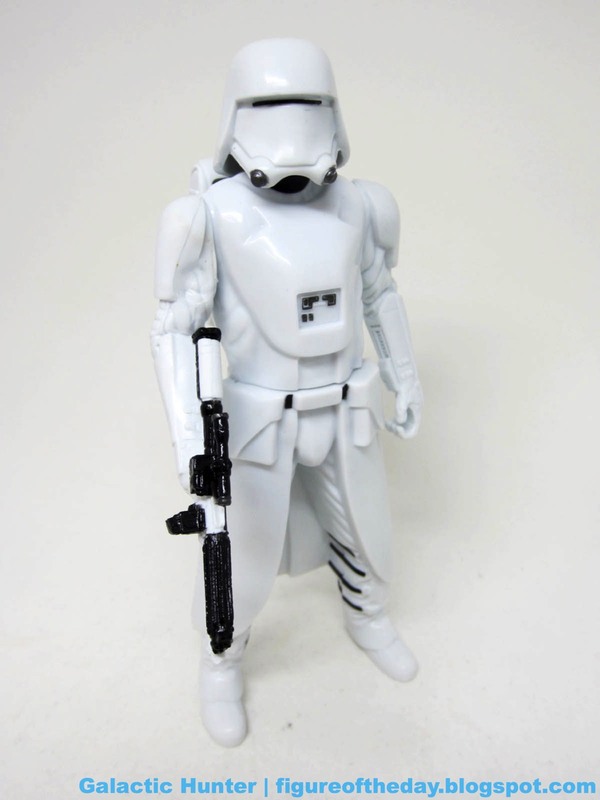 The sculpt seems to be pretty much the same as the various 3 3/4-inch versions of the trooper with minor changes. You'll notice less sculpted detail in the backpack, for example. Why the change? I have no idea - I can't imagine it has to do with actual cost. Most of the folds and wrinkles are in the same place, and you get a better look at the kama sculpt and how it would have allowed for a great range of motion were the figure not just one big piece from the waist joint down. It feels hollow and light, with only three more points of articulation at the neck and each shoulder. 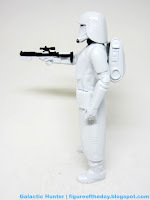 He stands there and looks neat, sized to fit with your more expensive figures if you can get past the lack of paint. One big change is that the pouches on the kama were moved forward slightly, but this may not be immediately obvious. 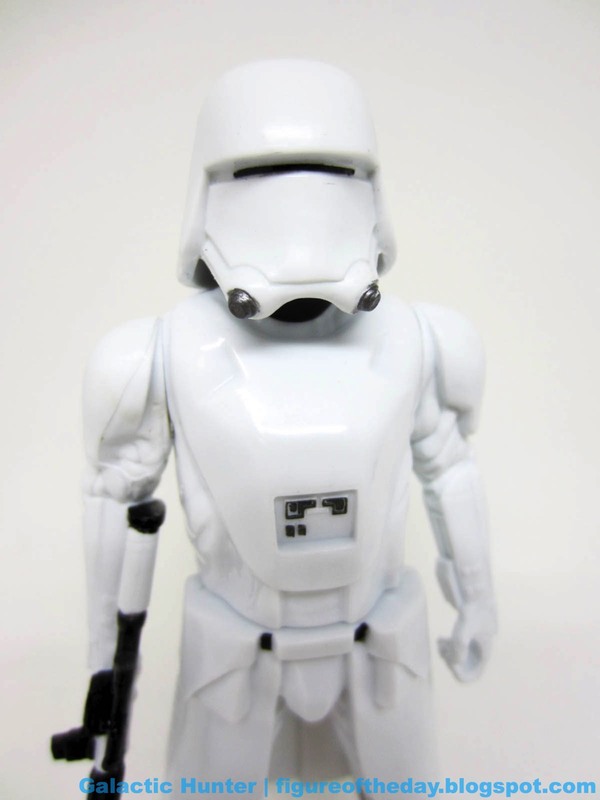 Jakks Pacific's big 20-inch Snowtrooper is similarly sculpted. 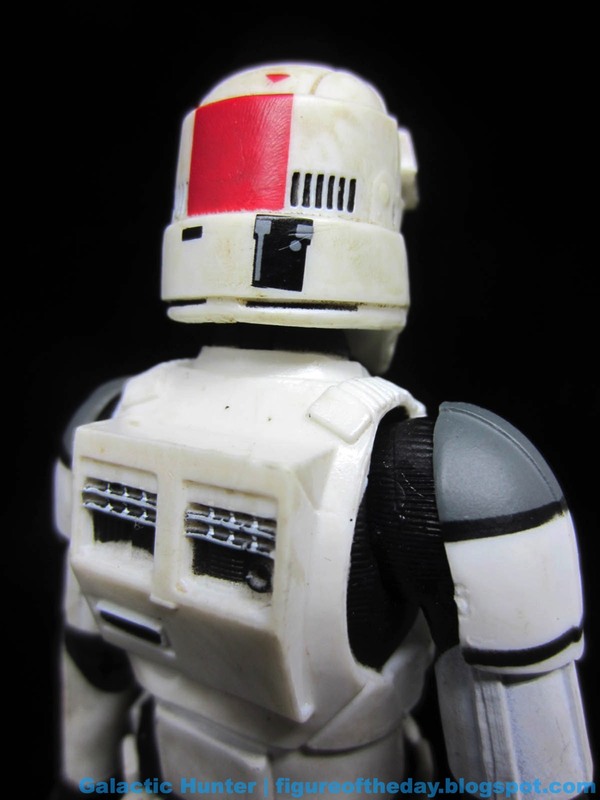 The McQuarrie-esque markings below the neck on the armor are left unpainted, as is the black stripe that goes around the back and sides of its helmet. Interestingly, the straps around the boots are still painted black while the markings on the shoulders are left off entirely. 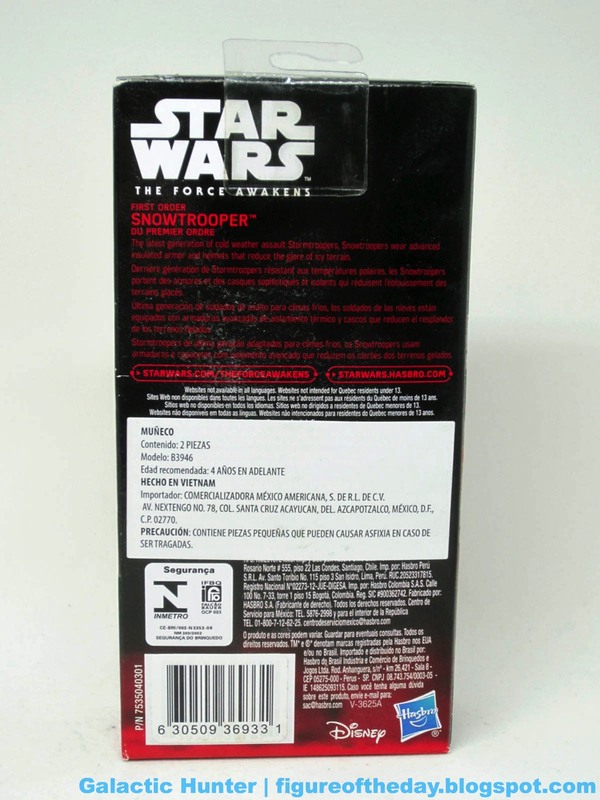 Much like Finn, the Snowtrooper blaster is decorated differently than the movie - you'll notice more black on it, with fewer separate markings overall. I think it looks great, visually speaking, but it's not authentic and it's not like you can swap it out without power tools. I thought I was going to say "Oh, you can skip this" without reservations - but here I am, somewhat enamored by its off-model deco and different-than-other-Hasbro-figure pouches. 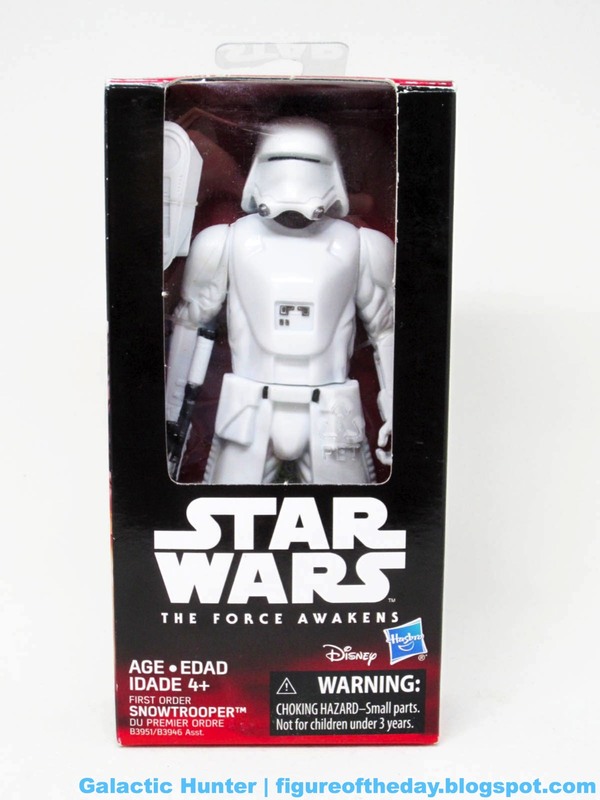 On a shelf with other First Order figures, this release would add some variety at a lower price. With any luck, it'll see distribution following the sequel line's launch this year. It's probably more likely that this one will just vanish and be forgotten, except for those who can't not have one and lurk on eBay until the itch is scratched. If you can score it for $10 or less, it's neat. I'd even say $20 or less is worthwhile, although once you get the small, efficient box in your hands you'd probably scream bloody murder about how you got ripped off. They're astonishingly small and less wasteful compared to most American toys, which is sort of gleefully upsetting.